Before a pavement is constructed, the materials that go into it must be mixed together and hauled to the job site. Trucking operations are a key part of getting the pavement mix to the right place. Both asphalt pavement mixes and portland cement concrete (PCC) mixes need to be properly loaded, transported, and unloaded in a timely fashion to ensure quality construction operations. In this edition of the RoadReady newsletter, we’ll look at important considerations related to transporting pavement mixes from the production facility to the paving site. Some of the factors involved in hauling pavement mixes apply to both asphalt and concrete products. In other areas, specific issues need to be accounted for that are unique to the type of mix being used for construction. We will look at a few topics of each kind. One of the critical steps in mix transport is making sure that the material is loaded into the truck correctly. Both asphalt and concrete mixes can become segregated as they are moved from the plant to the paving site, and it is essential to prevent this because a quality pavement should be constructed from material that is as uniform as possible. 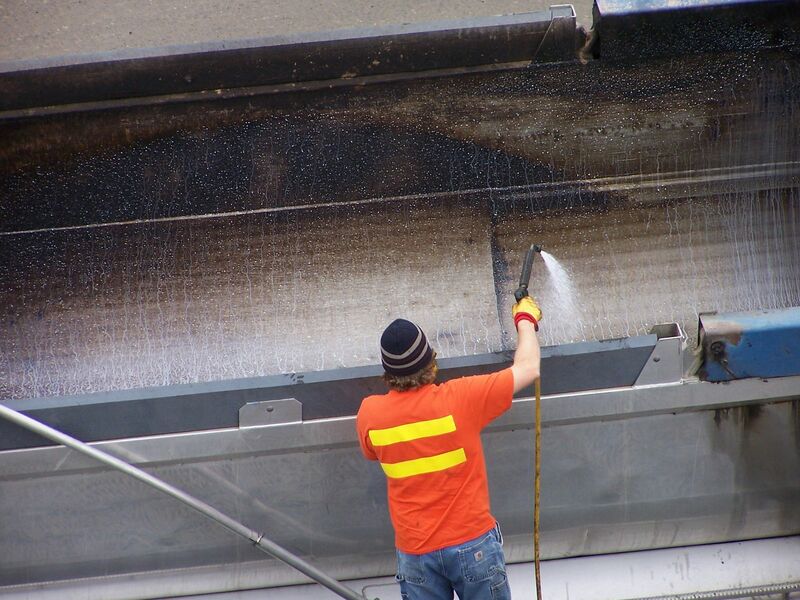 Asphalt is typically loaded by dropping the mix into a pile in the truck bed from a storage silo. This has a tendency to cause large aggregate particles to roll off the pile and collect around the base, creating the potential for segregation. The primary way to address this is with multiple-drop loading, by positioning the truck at different spots under the silo, thus creating multiple piles that keep the large aggregate contained and prevent segregation. The number and position of the drops should be adjusted based on the type of truck being used and the size of the bed. 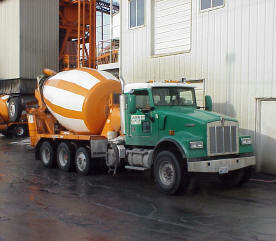 With PCC, loading is closely related to proper mixing procedures, particularly when a truck mixer is used for transport. PCC mix components must be introduced in an appropriate order so that they mix correctly. In general, water starts loading before other ingredients and coarse aggregate before fine aggregate; some admixtures also should not come into contact with each other until they are in the mixing drum. When the materials are not thoroughly mixed, segregation can occur in the form of cement lumps and balls in the concrete, or head packs where cement and fine aggregate get stuck in the drum entrance and are not properly mixed in. It is important to deliver the load of mix as promptly as possible to the paving site, to maintain the quality of the materials as well as to keep construction operations running smoothly. An asphalt mix will often have a significant temperature difference between the mix and the surrounding air. This can cause the exposed surface of the mix to develop a thin crust as it cools down, which can lead to segregation when the material is unloaded. A good practice to mitigate this issue is to cover all loads with a tarp to retain heat and keep out rain. Insulated truck beds can also be used to reduce heat loss. A load of asphalt mix being covered with a tarp. Concrete will begin to set if it is not unloaded quickly enough, so any delays in transport should be avoided. If a truck mixer is used, the PCC may be actively mixed during transit or merely agitated (using a lower drum speed to keep the material uniform and prevent loss of slump), depending on whether it was already mixed at the plant. Either way, it should not be mixed or agitated excessively, as this may drive too much air out and render the mix less effective. Avoiding segregation of the material is again a primary concern when unloading the mix. In the case of PCC, the material should be unloaded directly to the area where it is to be placed, if feasible, or as close to it as possible. Otherwise, segregation can occur if the mix is moved around too much. With an asphalt mix, the options to reduce segregation depend on the type of hauling truck used and the method by which the material is transferred to the paver. If unloading directly to the paver, end dump trucks should “break the load” first by raising the truck bed partway. This keeps the mix in a mass and prevents further segregation as it is deposited in the paver. Live-bottom dump trucks have a conveyor system that moves the load directly into the paver without segregation. Belly dump trucks deposit material in a windrow, so the mix must be picked up again by another machine to go into the paver. In this case, a material transfer vehicle can be used that remixes the material while it is picked up, addressing any segregation that may have occurred. In order to haul pavement mixes, trucks need to be kept clean so that no foreign material gets into the mix. This includes old asphalt or PCC that may have been left behind from a previous load. In the case of asphalt, the truck bed should be coated with a release agent such as lime water or soapy water (no petroleum products such as diesel fuel) that lubricates and prevents the mix from sticking. Trucks used to haul PCC need to be washed off and any leftover concrete recycled. 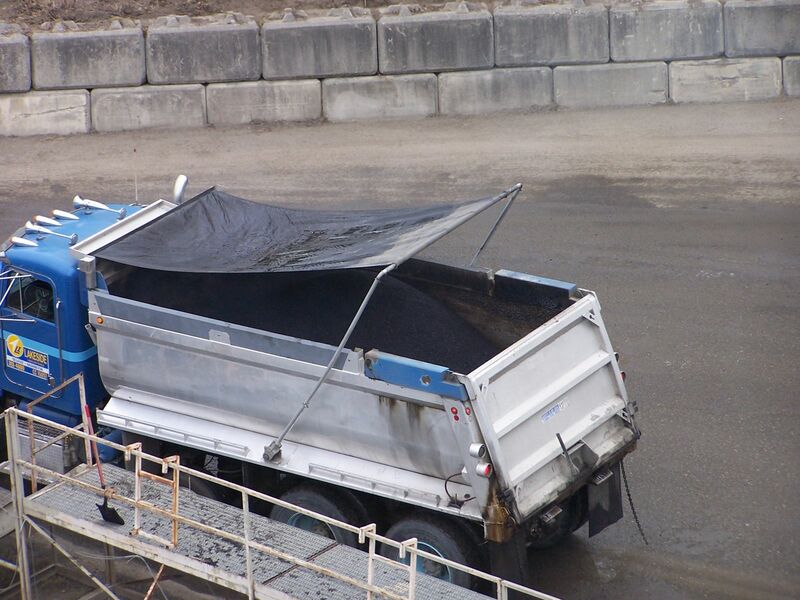 A worker applying a release agent to the bed of a truck before it is loaded with asphalt mix. Both asphalt and concrete are designed to be long-lasting once they’re in the pavement, but that doesn’t mean we have unlimited time to get them there. In fact, the reason they produce quality roads comes from how their material characteristics change as they go from a fresh, workable mix to a durable pavement structure. That means a fresh pavement mix is a little bit like fresh fruit—the qualities in it that we’re looking for have a limited shelf life. As a result, a smooth-running transport operation is critical for any construction project. Trucking is what gets pavement mixes where they need to go and makes sure they stay fresh along the way. Really true what is written in this newsletter. Very important to keep in mind these recommendations when we are involved with the quality, because these procedures will result in a Lasting Product.